Rock star Alice Cooper has been rumored to have Mormon roots. This is true, if you go back far enough. 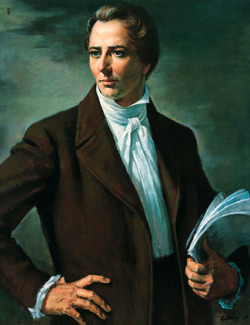 When Joseph Smith was prophet of The Church of Jesus Christ of Latter-day Saints, the Mormon Church, Sidney Rigdon was a leader in the Church and a moving orator. At one point, Joseph Smith ran for president of the United States. Rigdon was meant to be on the same ticket as a candidate for vice-president, but both candidates could not be from the same state. Joseph sent Sidney on a mission to Pennsylvania to establish residency there, but shortly thereafter, Joseph was martyred. Though most members of the Church acknowledged Joseph's conferring of the keys of the kingdom upon the twelve apostles and then the passing of authority to prophet Brigham Young, a few smaller groups splintered off. One was the Bickertonites, who thought Sidney Rigdon should lead the Church. This page was last edited on 26 August 2010, at 11:14.